I am not a “dinosaur geek.” I have been or am an SF geek, a Trek geek, a Dungeon & Dragons geek, a history geek, a Shakespeare geek. I have been or am many flavors of geekhood. But I’m not a dinosaur geek. I also get a frisson of sensual satisfaction when I contemplate just how marvelously amazing and incredible the story of life is on this planet, far more so than any delusional creation myth any Creationist could hope to imagine. Which brings up the opportunity to strongly recommend Richard Dawkins' The Ancestor's Tale: A Pilgrimage to the Dawn of Evolution, tracing Earth life from the first bacteria to the present day. Equally recommendable is this book. 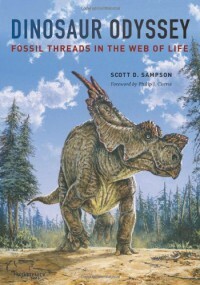 Scott Sampson writes well and clearly on a wide range of material as he lays out not only the history of dinosaurs but also the web of life which surrounded them – geography, climate, and all the other life forms that made up the Mesozoic environment. It’s a daunting task and there’s no attempt to write an exhaustive catalog of Mesozoic life but Sampson does succeed in evoking that long lost world and making you think about the complex relationships that sustain life on this planet. 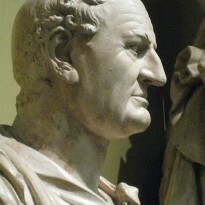 His purpose in this evocation is two-fold. One, it’s simply to recreate the world in which dinosaurs roamed based on the latest evidence. His second purpose is to get you to realize that this same complexity operates today, and that when the links in that chain are broken dire consequences ensue. I wasn’t shocked to read again about the awesome ongoing destruction of species, most of which in this epoch is at the hands of humans, but I was shocked to read about the numbers involved: There are around (ballpark figure) 13 million species in the world (of which only about 2 million have been discovered) and that by the end of the century, half may have gone extinct. It took Earth about 10 million years to recover the diversity it enjoyed at the end of the Mesozoic after the Chicxulub meteor fell 65 million years ago, and we’re well on the way to topping the die off from that catastrophe. The first part of the book was old ground for me as I had encountered most of the information at earlier points in my reading. That said, it wasn’t boring. As I mentioned in the previous paragraph, Sampson is an engaging writer and lays out the facts in an intelligent and easy-to-follow manner; and it never hurts to get a refresher course. I wouldn’t recommend this book for anyone younger than 14 or 15, and – even then – I’d only recommend it to budding paleontologists or adults who – like me – have an abiding interest in the subject. There are pictures but it’s mostly text, and that text doesn’t make allowances for grade-school reading levels. Actually, it wasn’t all old hat. Sampson does have a section about the energy levels found in any particular environment, and why most of the biomass is made up of plants, then herbivores, then predators. Again the numbers are astonishing: By the time you get to the level of predators, the energy extracted from the environment is on the order of hundredths of a percent, most is radiated away as heat. The last few chapters of the book introduced new information for me in the guise of Sampson’s theory about dinosaur physiologies and the causes for their extinction. Of course, most readers will be aware of the controversy about whether dinosaurs were cold blooded or warm blooded. The earliest theories all cast them as cold blooded like their reptilian cousins. Starting in the 1960s, “rebel” paleontologists presented evidence that dinosaurs (some, at any rate) were actually warm blooded. Sampson rejects the idea that there’s a hard and fast line between the two. Like most evolutionary mechanisms, it’s a matter of compromise and balance. Dinosaurs show evidence of both cold-blooded and warm-blooded traits and most likely achieved a balance between the two, which Sampson calls “The Goldilocks Hypothesis.” This balance maximized the energy devoted to production (which includes reproduction) and maintenance (of body temperature), and succeeded in the Mesozoic environment to such an extent that dinosaurs were the dominant animal family for 160+ million years (and their descendants, the birds, are still pretty successful). Why did the dinosaurs disappear (except for birds) 65 million years ago? Sampson writes that he started out in the gradualist school of theory, which says that climate change and other factors created environments many dinosaurs were ill equipped to handle and more successful organisms gained competitive footholds (including our mammalian ancestors). But he points out that at the end of the Mesozoic dinosaurs weren’t excessively less diverse than in earlier epochs. There had been a diminution in the number of species (or at least there appears to have been – Sampson is constantly pointing out that any theory is limited to recovered fossils, which can’t begin to tell the whole story; we’re always limited to speculation, albeit highly informed guessing) but there’s no reason to believe that the dinosaurian family was in danger of losing its overall dominance any time soon. Because of that, Sampson has come around to the idea that the dinosaurs were wiped out in a relatively short period of time. A period topped off by the Chicxulub meteor. One of Sampson’s strengths is his ability to evoke the Mesozoic world. I was fascinated reading about how that world would have looked: No flowering plants (including grasses) until very late in the Cretaceous (the final era of the epoch); extreme seasonality in the first era – the Triassic – when all land was locked together in the supercontinent of Pangaea and plant life may not have been able to establish footholds much beyond riverine systems; balmier, less seasonal weather as the continents broke up and warm, shallow seas covered much of the land; there were no polar caps until late in the epoch; and there were no tropical rainforest-type environments, most biodiversity was found in the mid-latitude regions of the planet. The ratio of production to maintenance between cold- and warm-blooded animals: Ectotherms (cold bloods) devote most of their energy to production; endotherms (warm bloods) to maintenance. Even the largest predators of the Cretaceous were yapping puppies compared to herbivores like Apatosaurus (aka Brontosaurus). It’s likely a full grown Apatosaurus was effectively immune from predation (barring age or sickness making it vulnerable) so that T. rex focused on juveniles and smaller predators on eggs and babies. Strongly recommended; a very enjoyable reading experience.